Dust off your comic books, Superman is back. Imagine this: In the latest issue, Superman sets up a secure perimeter around Metropolis. Or at least, he thinks it’s secure. While he’s leading his other life as Clark Kent, Lex Luther takes advantage of his accidental neglect to breach the boundaries Superman has set up, destroying the lives of millions in Metropolis and planting a heaping amount of Kryptonite for Superman to return to. The moral of the story? Just because a company has set-up data security measures, does not mean that they don’t have to be maintained. Often, attackers strike during the one moment of inattentiveness. Clark Kent represents the human factor, which accounts for the most flawed link within data security. Once he returns to the scene of the crime as Superman, as more than mortal, he will be debilitated again by his weakness. That’s why Data Security Breaches are Superman’s Kryptonite. While the idea of comparing a data security breach to a comic may seem amusing, it’s not. The narrative I just described could have just as easily been the 2011 Sony PlayStation Network attack during which 77 million PlayStation Network accounts were hacked and the company is said to have lost millions while the site was down for a month. An incident considered to be the worst gaming community data breach of all-time is a harsh reminder that even organization’s as large and as trusted as Sony can be vulnerable. For those of us in the cyber security industry, it’s not just about being cautious when it comes to our personal information, but about being the ‘hero’ in your organization and alerting them to this concerning issue. 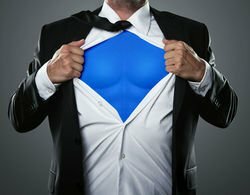 If more IT professionals have training in data security, less data could be breached across the globe, and Cyber Security Analysts would actually become real-world Supermen and Superwomen. Is your cape ready? Good. Cybrary’s Organizational Data Security Fundamentals skill certification provides training in security policy analysis and implementation of cyber security best practices. This baseline knowledge will help professionals to protect information, understand who/what to trust, stay ahead of attackers and know which regulations, if any, apply. Let’s fight crime together. Start your skill certification now!